The garden is slipping towards its nadir but I enjoy the reflective mood its undemanding winter nature invites. 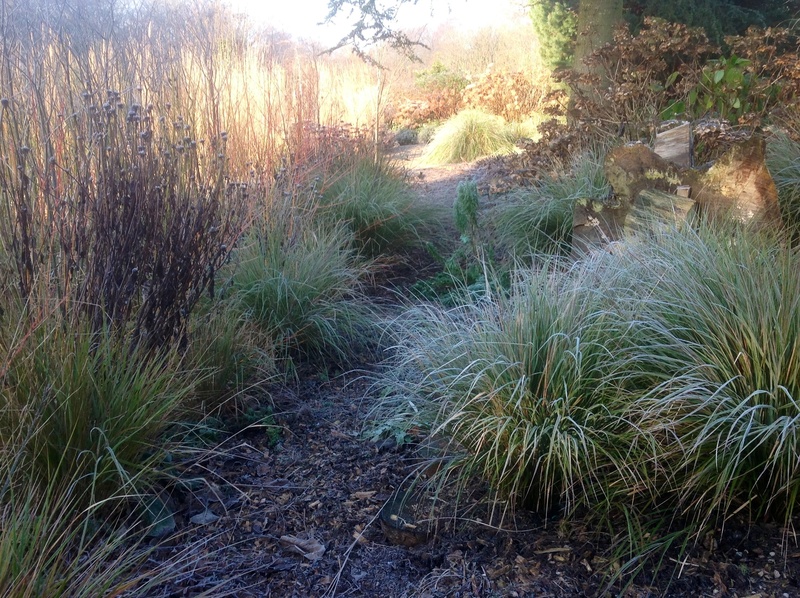 It is a last chance to appreciate the contribution that grasses make to the winter garden before they are cut back to allow the cycle to begin again. On a day to day basis, it is the terrace of grasses enveloping the house and flanking the main path that is most in view and first to be cleared come early spring. The structure of the terrace planting still has integrity, even in February, thanks to one hard working but easy to grow variety of grass. 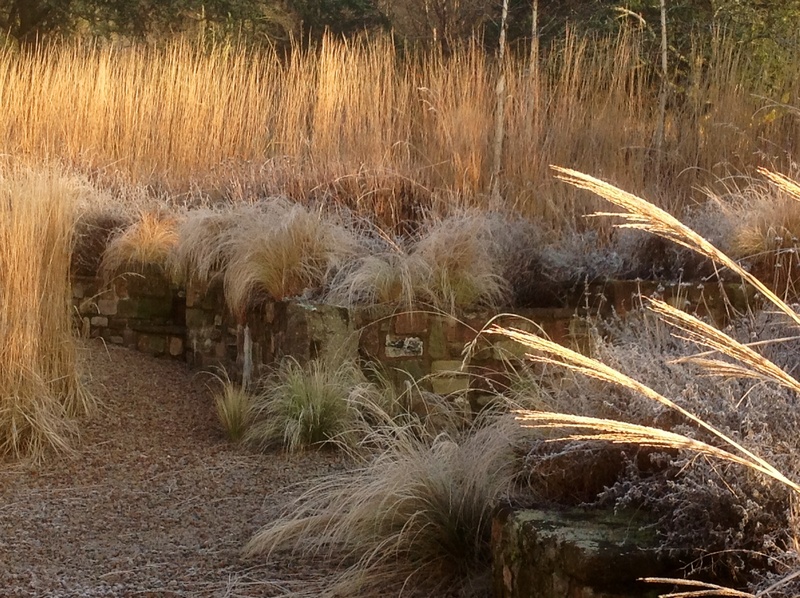 Calamagrostis x acutiflora ‘Karl Foerster’ screens the view of the drive, while the slightly shorter Calamagrostis x acutiflora ‘Overdam’ punctuates the lower terrace. Both are sterile hybrids, so were stocked from fist sized divisions of existing stands of mature plants. 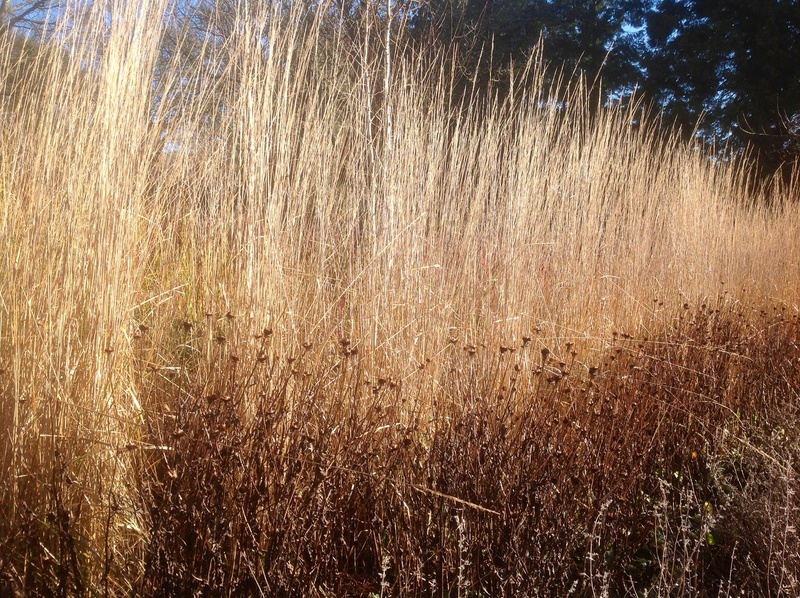 Calamagrostis is an effective foil for the dark seed heads of Rudbeckia deamii and the grey fringe of Nepeta ‘Six Hills Giant’, and the sepia toned scene, as promised by the gurus, does indeed fade gracefully as the weeks pass. 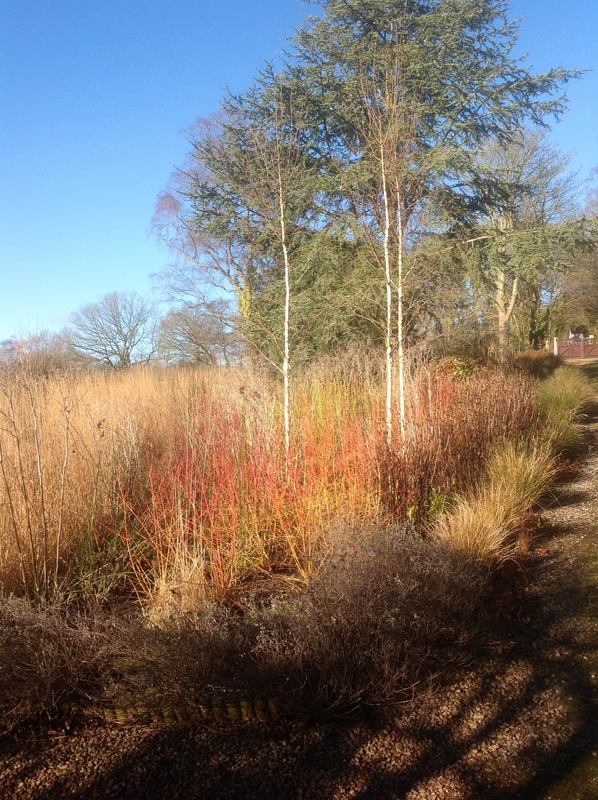 Softening the hard landscaping and contrasting with the upright calamagrostis, fine leaved fountains of Nasssella tenuissima colonise the thin clay subsoil at the wall base and Eragrostis curvula ‘Totnes Burgundy’ spills from the wall pockets. Both last well right through the winter and self seed, where the eragrostis is concerned, back to the more vigorous plain green form. A shrubby variety of evergreen phlomis juxtaposed with the vertical lines of the grass is striking. Unlike herbaceous varieties, this one is a bit of a thug, with its suckering habit, but was easy to propagate from cuttings and has quickly filled a rocky spot. On the flip side of the terrace is the winter garden proper, planted for the sheer pleasure of being welcomed home by a display of multicoloured cornus. The border peters into the drive, lined with Rudbeckia ‘Goldsturm’ and two year old seedlings of Anemanthele lessoniana. This self seeding evergreen grass will bulk out to make metre square mounds and sprays of flower in their third year. It has been spaced with this in mind, and for the foliage which takes on orange tints in sun. In dry shade, the anemanthele leaves are a matt olive green. Both sites are dry, but this variety of the three grasses that I have tried here, doesn’t seem to mind and it does a good job of marking the extent of the terrace and the transition to ground level. 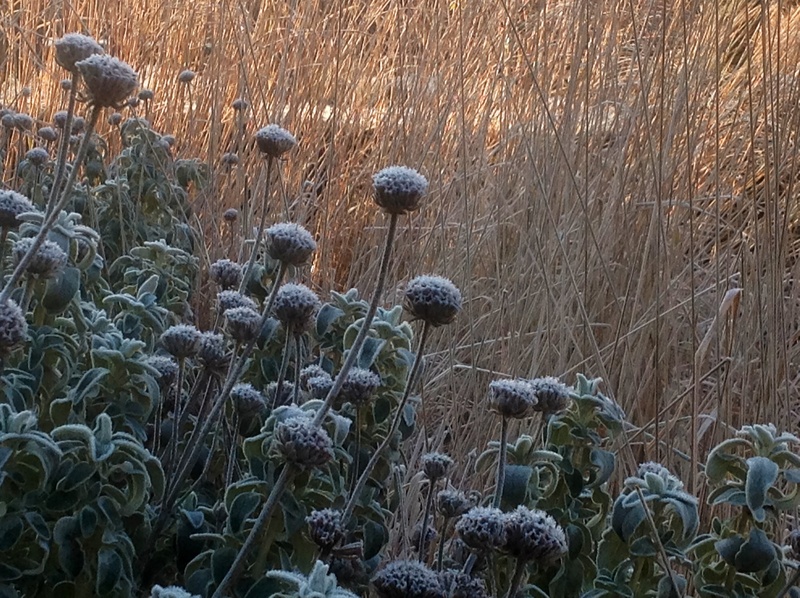 Late winter can be a sorry test for the perennial garden, grasses included. The more visible the spot, the harder it is to put up with a disappointing performance. But it is possible to select varieties and create combinations that will perform so well that, if you are like me, it makes you sigh when the time comes to cut them down.